Barossa Kia's Urgent Demo Runout! Massive savings on a huge range of Kia demonstrators. On your marks, Get Set, Go!.. to Barossa Kia’s Urgent Demo Runout. Sprint in for massive savings on a huge range of Kia Demonstrators. Looking to buy a New Kia, without the new car price tag? Check out our impressive range of ex-demonstrator vehicles for sale in Nuriootpa. 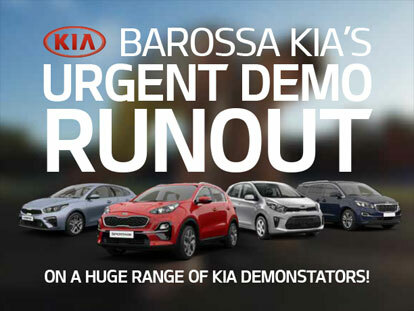 Get in first, to Barossa Kia’s Urgent Demo Runout and grab yourself a winning deal! I started working for the Barossa Auto Group, then moved into Kia sales. Kia products are ever improving with each new model becoming more impressive in terms of design and technology. The brand has Australia’s best factory warranty, and has done so for a number of years making the vehicles a safe and reliable option for customers. Kia vehicles are fast becoming a “vehicle of choice” among consumers and people love the vehicles and the features they offer. Personally, I have a number of Kia cars in my family and we are extremely happy with all of them, I enjoy working with the vehicles that I choose to buy.